We are proud to offer the following services, click below to learn more! 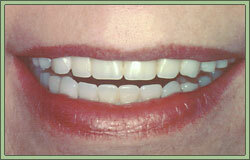 Dr. Frank W. Sallustio offers dental implant restorations in Sun City West, AZ. Whether you are missing all of your teeth or just missing one tooth, dental implants can permanently improve the quality of your life. If you are edentulous or are missing most of your teeth, implant supported dentures can give you a new set of teeth without the instability and regular maintenance associated with traditional dentures. If you only need to replace one or a few teeth, implants provide a more permanent solution than dental bridges or partials and help reduce the risk of bone loss. Dental implants are set in the jaw just like a natural tooth and the restorations are shaped and colored to flawlessly complete your smile. Bone loss is one of the most severe consequences of missing teeth, and it is not treated by traditional solutions like dentures and dental bridges. When teeth are missing, the jaw bone deteriorates. This can lead to further tooth loss and make it difficult for dentures to fit properly. Because dental implants are affixed to the jaw bone, they act like natural teeth and prevent the bone from diminishing. 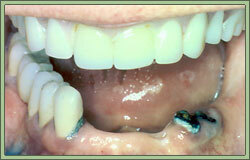 Because of the risk of bone loss, it is best to replace your missing teeth with implants sooner rather than later. 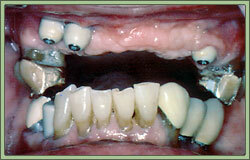 Do not settle for a temporary solution for your missing teeth. Act now to start enjoying the benefits of a full set of teeth again. If you are interested in dental implants in Sun City West, AZ, contact Dr. Sallustio’s office today to schedule your consultation. Today's patients have numerous options for teeth replacement. Whether you have lost your teeth to periodontal disease, decay, or injury you should seek immediate treatment to replace your missing teeth and preserve your jaw bone. As we lose teeth, the bone will begin to deteriorate without a root to anchor our jaw bone. This lack of bone density can cause problems later when patients start to seek treatment. Dr. Frank W. Sallustio is a prosthodontist in Sun City West, AZ who specializes in teeth replacement. There is great news for patients seeking dental implant treatment who might have issues with bone density or volume. Dr. Sallustio provides the All-On-4™ Treatment Concept that is designed to supply a whole set of new teeth while utilizing only four implants! This technology allows for immediate function of teeth and rarely requires bone grafting procedures, making All-on-4™ an excellent solution for patients with low bone density. Over the past decade, patients have benefited from a 98.5 percent success rate at the four year follow up appointment. After the dental implants are placed, your new or existing dentures act as a temporary set of teeth and are anchored on top of your dental implants that same day. You will never be without your teeth! After fully healing, which takes about three to six months, a new and final set of teeth are made and attached permanently. Maximize the use of available bone with the All-on-4™ technique. 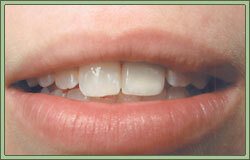 Dr. Sallustio can discuss all of your treatment options for teeth replacement. If you are interested in learning more about implant dentures in Sun City West, AZ call Dr. Sallustio's office and schedule your appointment today! Dentures, also known as false teeth, are are a removable solution for replacing missing teeth. They can be partial dentures with a metal frame to replace several teeth or a full set of dentures that cover the entire jaw, designed to replace a full mouth of teeth. Dr. Sallustio is a prosthodontist in Sun City West, AZ who specializes in the replacement of missing teeth. Dr. Sallustio can discuss the right option for you. Whether you have lost your teeth to decay, periodontal disease, or trauma, Dr. Sallustio can restore your beautiful smile with dentures. Dentures can take some getting used to and will not feel and function exactly like your real teeth, but unlike your parent’s false teeth, today’s dentures are comfortable and natural looking. Dr. Sallustio can help you you adjust to your new smile with post treatment techniques. If your treatment plan requires extraction of some of your existing unhealthy teeth, Dr. Sallustio is very sensitive to his patient's needs and will never make you go without teeth. After the extractions, immediate dentures are placed to give you a natural looking smile while you are healing. These will have to be redesigned or adjusted over time when healing is complete but you will never be without a smile! Dr. Sallustio will try to preserve as many of your natural teeth as possible and can even use some of your remaining healthy teeth to support a full set of dentures. The technology for false teeth has come a long way since your parent’s day. Dr. Sallustio can discuss your options for an over denture or an implant supported denture. 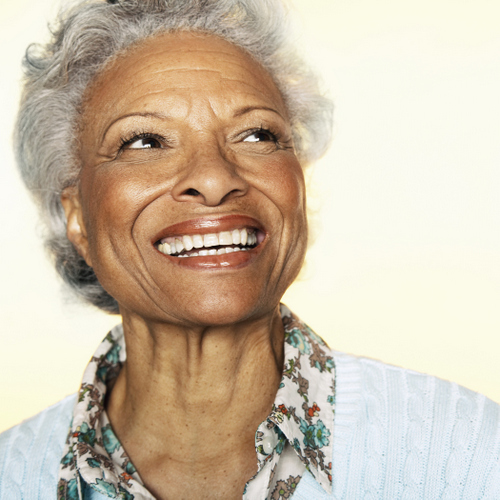 Retaining a few of your natural teeth can add stability to your dentures and help you cope with your new set of teeth. If the thought of false teeth makes you anxious, seek your treatment options for dentures in Sun City West, AZ with Dr. Sallustio. His expertise in the replacement of missing teeth is sure to put you at ease and get you back on the road to a beautiful, natural looking smile! Call Dr. Sallustio as soon as possible to set up your consultation. Bridges are designed to bridge the gap between one or more missing teeth and is typically comprised of two or more crowns fused together and attached to the surrounding teeth. Click on the video to the right to view the bridge procedure. 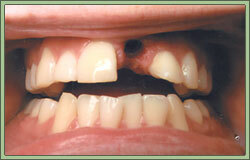 Missing teeth can drastically reduce the quality of your life. It can be difficult to eat without a full set of teeth and having gaps in your smile can affect your self-confidence. Dr. Frank W. Sallustio can replace your missing teeth with partial dentures or a dental bridge in Sun City West, AZ. Do not wait to restore your smile and your bite. Replacing your teeth will increase your quality of life. If you are interested in replacing your missing teeth with partial dentures or a dental bridge in Sun City West, AZ, Dr. Sallustio today to schedule your consultation. A dental crown is a “cap” that is tooth shaped and placed over the top of an existing tooth. Dental crowns are very commonly used to fixed broken or damaged teeth and look and function like your real teeth. Dr. Frank W. Sallustio is a prosthodontist in Sun City West, AZ who specializes in replacing missing teeth and restoring existing teeth through restoraive dentistry. If your treatment plan requires a dental crown, Dr. Sallustio will ensure it fits tightly over the existing tooth and that it looks and functions like surrounding teeth. No one will know it is not your real tooth! Receiving a traditional dental crown requires two visits. At the first visit, your tooth is reshaped on the top and sides. An impression is taken to be sent to the lab where the dental crown will be fabricated. 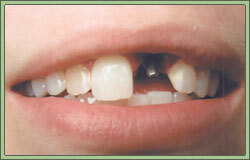 A temporary tooth is made and placed over your tooth that is to receive the dental crown. It usually takes two to three weeks for the new dental crown to come back from the lab. At your next appointment, the new crown is permanently cemented and adjusted to fit your bite. Whether you have a broken tooth, have had a root canal, or need to replace a large filling, Dr. Sallustio can provide you with excellent patient care and restore your beautiful smile. Call our office today to make your appointment. At their dental exam, many patients express concern about being exposed to radiation when they are due for their dental x-rays. While this radiation exposure was already extremely minimal, digital x-rays utilize the latest advancements in dental technology to decrease radiation exposure by 90%! Dr. Frank W. Sallustio is a prosthodontist in Sun City West, AZ using digital x-rays in his office. Have peace of mind at your next dental exam knowing digital x-rays are very safe and an easy way to diagnose any dental issues. 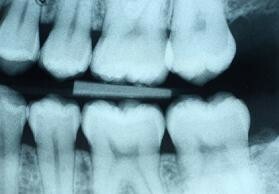 With digital x-rays, a sensor with a sanitary barrier is placed inside your mouth. This sensor is moved to different positions depending on which x-rays are needed. Since there is no film, there is no need for each new x-ray to be switched out of the holder, resulting in faster appointments and less time in the chair. There is no film to be developed or mounted. Your x-rays are immediately projected onto a screen in front of you. This allows for easy explanations of your treatment options and gets you, the patient, involved in co-diagnosis. Do not let fear keep you from receiving the proper dental care for accurate diagnosis. Rest easy at Dr. Sallustio's office knowing digital x-rays are safe and effective. Save your anxiety and your time in the dental chair! Call Dr. Sallustio's office and schedule your appointment as soon as possible in Sun City West, AZ. If you are like most people, you dread going to the dentist. It just gets worse when you find out you need to have a dental impression taken for your treatment. For many, having to bite down on that sticky mound of goop until it hardens in your mouth is worse than the actual procedure. There is good news for the gaggers! Dr. Frank W. Sallustio is a prosthodontist in Sun City West, AZ offering iTero® digital impressions in his office. iTero® is state of the art technology that allows Dr. Frank W. Sallustio to take extremely accurate renderings of a patient’s teeth and bite without using any messy goop! iTero® digital impressions can be made for a variety of different treatments and the images of the patient’s mouth are much more accurate than with a traditional dental impression. Sometimes air bubbles or grooves can occur that distort the impression and cause tiny flaws in the final product, making the next visit for delivery much longer and uncomfortable for the patient. For instance, if a patient needs a dental crown or bridge, Dr. Sallustio or his assistant will use an ergonomically designed wand to scan the patient’s teeth and bite where the treatment is to be done.Dr. Sallustio can make any needed modifications immediately while the patient is still in the chair. The highly accurate images are wirelessly sent to the laboratory where a model is made and the dental crown or bridge is fabricated. When the patient comes in to have the crown delivered, their appointment time is greatly reduced with a near perfect dental impression made with iTero®. If thinking about getting treatment done at the dentist makes you gag, come and benefit from the latest technology and ask for iTero® digital impressions. If you are looking for a dentist to perform restorative dentistry in Sun City West, AZ, call Dr. Sallustio’s office and make your appointment today! Now you can see what the dentist sees! Many patients are confused when told that they have a dental cavity or that they need a costly dental crown when they cannot see a problem or feel any pain. Dr. Frank W. Sallustio is a prosthodontist in Sun City West, AZ who uses an intraoral camera in his office to accurately diagnose treatment and keep his patients informed. Sometimes you cannot see or feel a dental cavity. With the use of an intraoral camera, Dr. Sallustio can show you exactly where it is and how to fix it. An intraoral camera is roughly the size of a pen and is equipped with a light. The camera is extremely sanitary, as a new and disposable barrier is put on the mouth piece every time it is used on a new patient. Dr. Sallustio can take a close up picture of your damaged tooth and transmit it to a TV screen or computer monitor. You no longer have to decipher confusing x-rays or rely solely upon a difficult to understand explanation from the doctor. You can SEE exactly what is wrong. These clear and close up images allow Dr. Sallustio to quickly and accurately diagnose your treatment which means less time in the chair for you. Dr. Sallustio can not only diagnose a dental cavity by using an intraoral camera, but also get an illuminated view of your gums and soft tissue. Tissue abnormalities, infections, and even oral cancer can be found and quickly diagnosed, with treatment starting right away. An intraoral camera allows Dr. Sallustio to see angles of your mouth and teeth that otherwise would be difficult to see. Early detection of cracks in your teeth is paramount to avoid unnecessary pain later when your tooth might break and become infected. These images can be stored in the computer or even printed out for you to take home. Get involved in the discussion! Go to a dentist that uses an intraoral camera in Sun City West, AZ. Call Dr. Sallustio’s office to make an appointment at your earliest convenience. While many dental procedures do not strictly require oral sedation, some patients experience a high degree of discomfort and agitation in the dental chair. Because a healthy mouth is vitally important for a healthy and pain free life, dental anxiety should not keep patients from pursuing dental care. Through oral sedation dentistry, Dr. Frank W. Sallustio aims to improve patients’ comfort and make dental services available even to those with severe dental anxiety. Patients take a small pill an hour before their appointment. This makes the patient relaxed and drowsy. Family members or companions then take them to the office where their health is closely monitored and the procedures are completed. Once completed, they are escorted home where they sleep and rest until the sedative wears off. The sedative keeps the patient calm and relaxed throughout the entire visit. There are a variety of oral sedation techniques available that can calm your anxieties and make dental treatment possible again. You do not have to choose between anxiety in the dental chair and pain because you avoided dental treatment. Oral sedation dentistry can help you manage your anxieties and give you a better, healthier life. If dental anxiety is keeping you from having a healthy, pain free mouth, contact Dr. Sallustio to find out more about oral sedation dentistry in Sun City West, AZ. you to choose the correct veneer color. 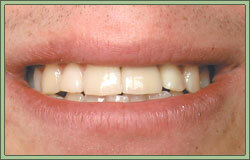 With temporary veneers in place, you will be on your way. Then, when your custom pieces are complete, you will come back. At this point, we will start off by cleaning your teeth. The solution we use will help to make sure the bonding agent sticks securely to your teeth. When it comes to cosmetic procedures, arguably the most commonly administered and most well-known option is tooth-whitening. Here at Frank W. Sallustio DDS, we want to give you back that radiant smile of your youth or just overall gives you a brand-new confidence to flaunt. Our professional whitening system is guaranteed to provide you with a strong and dazzlingly white smile by the time we are through. For more details, call our office today. 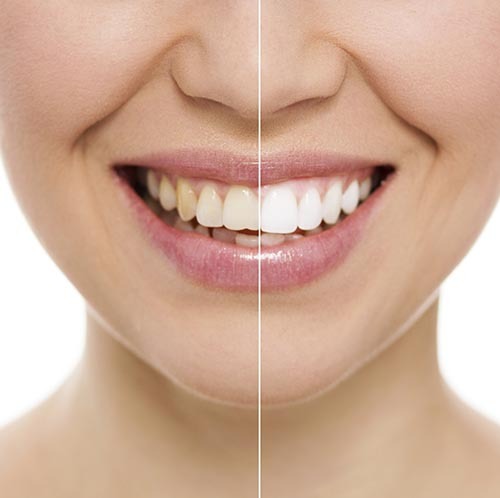 Teeth whitening, also known as teeth bleaching, is a way for us to professionally and safely lightens your teeth a few shades so they are the sparkling white you see in movies, or whatever shade your desired effect may be. This changes the color of your tooth enamel overall; it does not simply lift stains. It is much safer and much more effective than whitening toothpaste or over the counter whitening strips or gels. We have years of experience which pushes us to use cutting-edge technology to give you a smile you have been dreaming of. White teeth are easily one of the most generally accepted aesthetically pleasing features a person can have, and we aim to put that power right at your fingertips. While you may need a touch up on occasion, with limited smoking, coffee, wine, and other staining foods and beverages, you may be able to make these results last well beyond a year. Our tooth whitening system is split between in-office care and at-home care. Essentially though, we will assist you and help you to get a safe and functional at-home whitening kit. You will need to set up two appointments with us, and in each, we will do something a little different. In your first appointment, we will take impressions of your teeth using putty and a tray. These impressions are very important, as they will be sent to a lab and used to create for you a custom-made whitening tray that you will be able to house whenever you need it. Once we have those trays back, you will come in for your second appointment. Then, we will make sure that your trays properly fit your teeth and your bite pattern to ensure that the whitening material will fit every nook and cranny. Then, it is up to you. You can wear these trays (with the whitening solution inside) two times a day for several weeks, or overnight for the same period. Your teeth may become sensitive, this is natural, but it will pass. By the end of treatment, your teeth are guaranteed to be shades brighter! 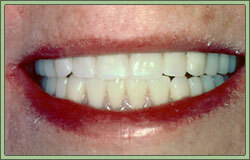 Teeth whitening is safe with us, and we will make sure that you get great results cast. Frank W. Sallustio DDS is here for more than just your restorative dentistry needs, and we want you to be beyond pleased with the results of your procedure. Give our office a call today to get all of your teeth whitening questions answered!